President John Hennessy visited the Bing Overseas Studies Program’s (BOSP) Breyer Center for Overseas Studies in Florence, Italy for the first time early on Friday. Hennessy has been on sabbatical since Feb. 15. Hennessy began his visit with a brief lesson from longtime Stanford in Florence lecturer, Timothy Verdon. Verdon, a priest at the Duomo (Cathedral Church), gave him a taste of the three-hour lectures students enjoy once a week on Florentine art and urban history. The lesson was followed by a tour of Palazzo Capponi, the soon-to-be home of the Breyer Center for Overseas Study in Florence. Stanford’s new home is in fact a palace, a Renaissance palazzo, built in the early fifteenth century and located directly across from the Uffizi Museum and Palazzo Vecchio. Palazzo Capponi is less than a block from the program’s current home yet the move will provide more space, updated technology and a multifunctional terrace space for students to study, eat and relax. The new building will be ready to house its first Stanford students next autumn quarter, following a summer opening. “Palazzo Capponi will give Stanford in Florence a prestigious home and, most importantly, it will ensure that more and more appropriate space is available to our students and to the Program as a whole,” read the Winter 2012 BOSP Alumni Newsletter. Although Friday’s lunch was Hennessy’s first visit to the Stanford in Florence campus, he is quite familiar with the city itself. He has travelled extensively in Italy and was happy to share his experiences and travel suggestions with the students currently in the program. 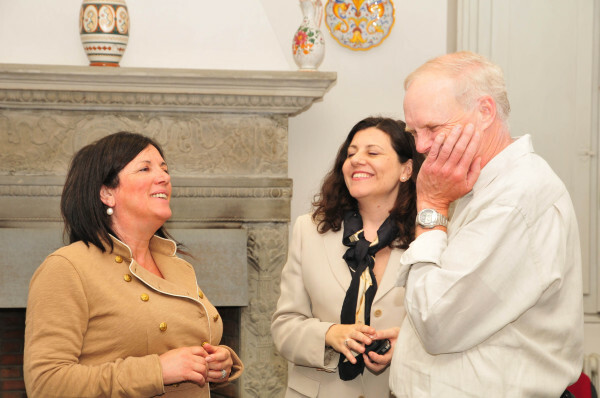 “President Hennessy was much more familiar with Florentine culture and history than I expected – it was really a pleasure to talk with him,” said Fosca D’Acierno, academic student services coordinator. “He was very open and spoke without pretense, mingling with both students and professors. It felt more like a cocktail party than a formal lunch,” said Brian Brege ’07 M.A. ’07 Ph.D. ’13, a recent alumnus of the Stanford in Florence Program. Hennessy is scheduled to return to campus before Commencement weekend starting on June 14. Both writers are currently participating in Stanford in Florence.